Your patients are online. Are you? A business website brings you closer to your patients by establishing trust, providing information, and by giving a friendly face to your business. The Internet has completely changed the way people find your practice and your business. From cars to airplane tickets, the Web has become the first and last place people look to learn about new products and services. Chances are any new patients that have walked through your door in the past 5 years have already used a health care insurance website, a health services search website or even just an online Yellow Pages site to find you. A website establishes your practice where patients are... online: A website allowing patients to find your practice when they search online. Patients trust you more: A website can provide detailed information about who you are and what your specialties, degrees, and credentials are. Patients learn about your specialization: Especially if you have a medical specialization, you can use your website to educate your patients about a procedure or treatment even before they walk through the door. Patients can contact you more easily: A website gives patients a variety of ways to contact you by listing email addresses, phone numbers, mailing addresses and more. Your office may be closed, but your website is always open: Provide immediate information for patients who need immediate non-critical care. 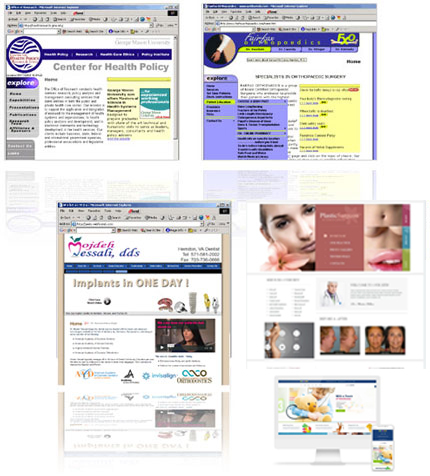 WebForMDs.com builds wonderful looking and highly functional websites for medical practices just like yours. Your customers and patients are out there and they are using the web to find services you provide. If they don't find you, they will definitely find your competitors. Don't wait and don't be left in the dust. Contact WebForMDs.com today and learn how we can help your website get the attention it needs.